These are foot actuated hydraulic transmission, known as treadle pumps, able to draw water from depths of 30, 60 or 120 metres depending on the models and can be used to provide a drinking water supply. These pumps are used in rural areas as well as in some small towns, especially in Africa. The principle was invented in the 1970s by Marc Vergnet, a French engineer, on assignment in Burkina Faso at the time. This type of pump only has a single treadle (not to be confused with two treadle piston pumps destined for irrigation – refer to Factsheet E 58 “Twin treadle pumps for irrigation”) and it implements a simple and innovative hydraulic transmission process for drawing water at great depths, even after passing through hard rocks and supplying populations with drinking water. These hydraulic pumps are robust ones, made from materials that protect them from corrosion and most often easily repairable in the village itself and that generally benefit from good after sales maintenance and spare parts service. Although their cost is fairly high, it is still often less, for comparable specifications, than that of quality hand pumps. For the basic two treadle models, mainly small farmers with limited financial resources, and also rural towns for single treadle hydraulic pumps, in Africa or South East Asia where there are already numerous manufacturing or sales and maintenance structures in place. These force pumps are primarily made by French company Vergnet, hence them often being referred to as “Vergnet Hydropumps”. The transmission force used is hydraulic and not mechanical like that used by almost all other kinds of water pumps, whether treadle or hand driven. (handle, delivery opening (pouring spout), support plate, seal, treadle, guide nut, bottom travel stops, control cylinder made from brass or stainless steel). (control or pumping hose made from flexible polyethylene, the delivery hose made from polyethylene, with “Septor” connectors on each end and a safety rope). (force valve, pump body made from stainless steel, the suction valve with its filter and especially a baudruche). 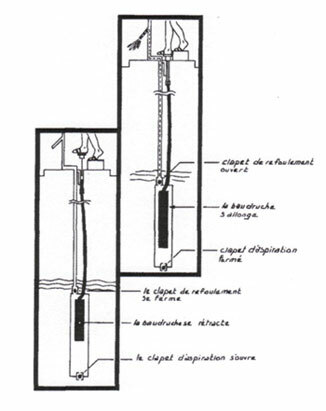 Water transmission between the suction valve and the pump head is not performed, like other pumps, using a mechanical approach with pistons actuated by a lever, but hydraulically, thereby considerably reducing the mechanical parts in motion thanks to a treadle actuated bladder (the baudruche). Suction and forced delivery are ensured by valves and the baudruche, a deformable rubber cylinder that is 76 to 159 cm in size, depending on the models and the volume of which is varied inside the sealed pump body, using the outside treadle. When the treadle is pressed down, the water pressure on the baudruche increases, stretching it, and this closes the suction valve. Then the water contained within the pump body is pushed towards the delivery opening. 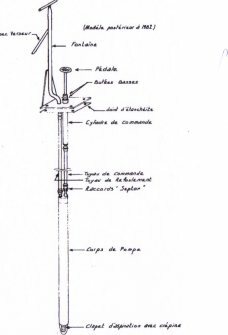 Then once the treadle is released, the baudruche tends to return to its initial shape, sucking up water thanks to the suction valve opening and the delivery valve closing. 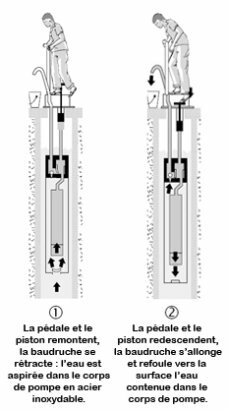 It is therefore important to drill the ground before installing the pump so as to determine the static or dynamic level of the water in the well or drilling. Pumping must take place from a level sufficiently far below the piezometric level for, even after intensive pumping or during dry spells, the pump body must never be above the water level. Maintenance : Every day : clean the pump and its surroundings, remove any surface water that may have accumulated. Every month : record pump yield and check the condition of the concrete slab ; if the yield falls, check the condition of the wearing parts on the surface. Every year : check the complete assembly. => Replace the rings - this can be done by the local population. => Re-prime the pump - this too can be done by the local population. => Replace this ring - this too can be done by the local population. => Call in a qualified technician. => Tighten up the nuts or replace them and renew the cement covering. Pump components are easily replaceable by the villagers themselves given the simplicity of the mechanism and the ease of access, at ground level, to the various standardised wearing parts that make up the pump. This enables a certain autonomy on the part of the user villages. - They are all made from stainless steel or polyethylene, stopping corrosion and ensuring that the pump has a significant operating life (the average age of the 80,000 pumps installed is 15 years). Some of the parts can easily be made locally. - The pump’s technology means that it can supply a raised tank or water tower. 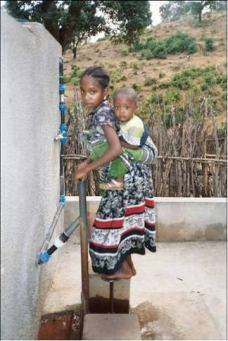 - Children also like this pump given its fun aspect (foot operated). - Maintenance costs are low. - The manufacturer has set up significant after sale support : 350 stores and 3,000 repair centres. - Its high cost. This is due to the quality of the mechanism and the components used as well as by the quality of the baudruche bladder (approx. €230 for 60 metre depth models). 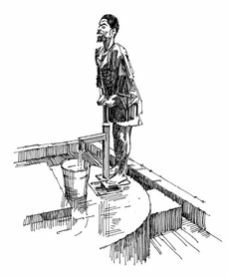 It is however guaranteed for three years and offers an average service life in excess of ten years (generally 3 to 5 years only for very different small two treadle “treadle pumps” - (please refer to specific Factsheet E 57). - The amount of human energy required is non negligible, but far less than that required by hand pumps as body weight makes pumping easier. - The principle used to power the pump, by foot, which is appreciated by children, is however sometimes viewed badly by some communities for ethical reasons especially due to the risk of seeing women’s thighs… (leading the manufacturer to offer the same pump but hand powered). Depending on the model and the drilling depth and the transportation costs. In 2010, the “ex-factory” sale price was €1,500 excl. VAT for the HPV 60 (30 metre) pump and €3,400 excl. VAT for the 100 (80 metre) pump. Maintenance cost : Low, some €20 per year. It is important to first raise the population’s awareness as to the use and maintenance of hydropumps, as well to hygiene and to ensure that an effective and durable management committee is in place or can be set up. These are points that the management committees must handle as these various points could lead to a pump malfunction or the destruction of certain materials. This process has been very useful in the Sahel during the dramatic dry period that occurred during the 1970s caused by the rapid progression of the desert and that led to many victims among the population and decimated numerous herds. Yet there are numerous water reserves under the Sahel, but too few wells and even less solid water pumps able to be easily installed and maintained. This is the context in which NGO SOS Sahel launched an operation for installing and maintaining 3,000 pumps, choosing the Vergnet hydropump for this role. Some 3,000 villages were therefore equipped and spared the effects of the drought. These hydropumps make life easier for women and children, who to find water had to travel many kilometres. Their inhabitants even did their own pump maintenance given the simplicity of the mechanism.